In contrast to Professor Solanki’s conclusion that Man was nevertheless the main cause of global warming since 1950, Dr. Lüdecke’s research shows that the Sun is the real culprit. The new analysis indicates that changes in the Sun’s output of radiation, which depends upon anomalies in its magnetic field that show up as sunspots, are what really drives temperature changes here on Earth. Dr. Lüdecke said: “The Sun is still recovering from the Maunder Minimum, the 70-year period from 1645-1715 when there were hardly any sunspots. It was less active then than during any similar period over the past 11,400 years. It was then that the Hudson in New York and the Thames in London used to freeze over in the winter. Dr. Lüdecke’s analysis of the 200-year record of monthly temperatures measured by thermometers at five northern-hemisphere stations shows the Earth cooled almost as much in the 19th century as it warmed in the 20th. Also, two 2000-year temperature reconstructions – one from a stalagmite, one from tree-rings – indicated that 100-year ups and downs in global temperature far stronger than those of the past 200 years were commonplace, strongly contradicting the “official” hypothesis that 20th-century global warming is unusual. Contact: Dr. Horst-Joachim Lüdecke, moluedecke@t-online.de. Click following PDF link to See Lüdecke, H.-J., 2011, Long-term reconstructed and instrumental temperature records contradict global warming, Energy and Environment 22,6. Table 1. 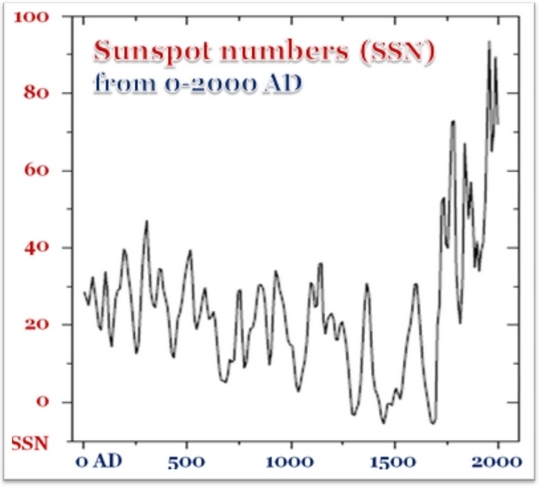 A “hockey-stick” graph (above) of annual mean sunspot numbers (SSN) from 0-2000 AD, revealing clearly for the first time the startling growth in solar activity from 1700 until the peak of solar activity in the last 1000 years, which occurred in 1960 (Lüdecke, 2011). For comparison, the notorious “hockey-stick” graph of reconstructed and instrumental northern-hemisphere surface temperatures (right) by which the UN’s climate panel attempted to abolish both the Medieval Warm Period and the Little Ice Age., It is very likely that the change in sunspot numbers (above), not Man, was the chief cause of recent warming (right).